Author & Punisher is a sonic and visual artist venturing into a new league of unwieldy, music and live performances utilizing his custom designed instruments on his albums and dynamic live displays. After leaving a career as mechanical engineer in Boston to focus on art and sculpture, Tristan Shone, the creator and sole artist behind Author & Punisher, moved west to pursue his MFA in Southern California. 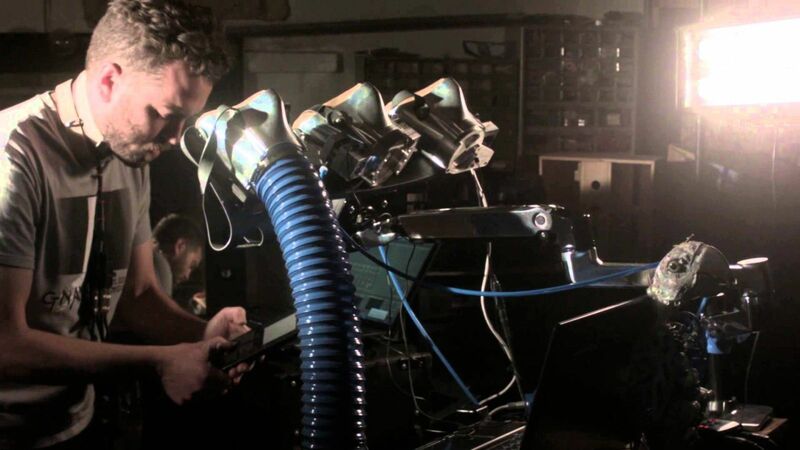 In the metal and machine shops of University of California, San Diego, Shone forged a relationship with design, sound and fabrication that ultimately yielded A&P’s first music and mapped the journey away from traditional instrumentation towards custom made, precision machinery that he calls Drone Machines, Dub Machines and now his series of Masks. Shone used his technical knowledge, along with his artistic background to create what Wired Magazine has hailed as his own “special brand of doom metal.” As experimental as he is at times, with the high fidelity drone so thick and pulsating it lays a sonic lead blanket waving over your core, it lingers only as long as it needs, regrouping or intensifying with pounding live rhythms and vocals. The sound builds up anxiously but always rewards with a hint of hope in the form of epic sonic phrases leaving you feeling exhausted but satisfied. The custom devices that drive A&P begin mostly as big chunks of aluminum and steel that are worked into all manners of wheels, throttles, pedals, and masks to manipulate sound live. Shone’s electromechanical arsenal and physical approach to live production become to heavy music what Survival Research Laboratories was to live, unscripted performance art. With Melk En Honning, Shone has incorporated various drone machinery together, multiple physical rhythm machines, some synth and the new electromechanical masks that began to appear in A&P performances across the U.S. and Europe in 2014. After a year of heavy touring and festival appearances, the goal with this album is to capture the live dissonant power of the A&P experience. The combination of Anselmo’s persistence, expertise and Shone’s new experimentation with various vocal devices, led to a vocal-prominent, bass heavy album that combines A&P’s signature elusive drone sequences and hard hitting rhythms with unexpected terrains of melody and musicality that sustain Shone’s reputation as an unorthodox innovator in a class all of his own.